Contrary to what many people have been told as children, wet hair can’t cause a cold. Neither can be stepping into cold temperatures without a hat or earmuffs. Colds are actually caused by cold viruses. More than 200 viruses can cause the common cold. While some risk factors are hard to control, others can be managed. Learn how to lower your chances of catching a cold and passing it onto others. 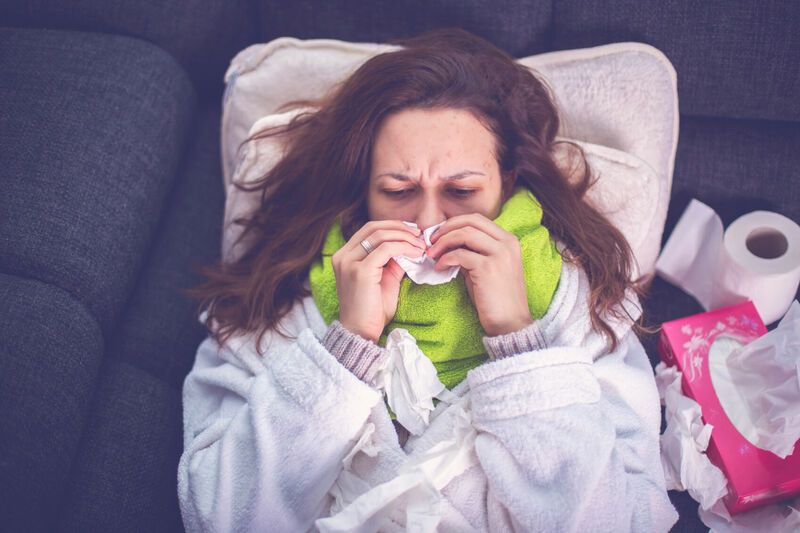 The cold virus is more common in cold-weather months, such as fall and winter, and rainy seasons. During these seasons, you’re more likely to spend a lot of time indoors. This puts you in closer proximity with other people, raising your risk of catching the cold virus and passing it onto others. To lower your risk of getting sick or making others sick, practice good hygiene. Wash your hands regularly. Cover over your mouth and nose when you cough or sneeze, using a tissue or the crook of your elbow. Certain climates and seasonal conditions can also make cold symptoms worse. For example, dry air can dry out the mucous membranes of your nose and throat. This can exacerbate a stuffy nose and sore throat. Use a humidifier to add moisture in the air of your home or office. Change the water daily and clean the machine regularly to avoid spreading bacteria, fungi, and irritants. Children under the age of 6 are more likely to catch a common cold. That’s because their immune systems haven’t matured yet or developed resistance to many viruses. Young children tend to come into close contact with other kids who might be carrying viruses. They’re also less likely to wash their hands regularly, or cover their mouths and noses when they cough or sneeze. As a result, cold viruses tend to spread more easily among young children. Lack of sleep can negatively affect your immune system, which is your body’s natural self-defense system. Inadequate sleep raises your chances of catching the common cold, as well as other diseases. Psychological stress also appears to raise your risk of developing a cold. They suggest it affects how the stress hormone cortisol works. The hormone regulates inflammation in your body. When you’re under stress, cortisol may be less effective at tempering your body’s inflammatory response to the cold virus. This may cause you to develop symptoms. Smoking disrupts your immune system. This raises your risk of catching the cold and other viruses. Inhaling tobacco smoke also exposes you to toxic chemicals that can irritate your throat lining. Symptoms of the common cold can be worse if you smoke. Inhaling secondhand smoke also raises your risk of developing cold symptoms. Children and others who live in homes where people smoke are more likely to develop serious respiratory conditions, such as bronchitis and pneumonia. These conditions can develop from the common cold. If you smoke, take steps to quit. Ask your doctor about smoking cessation tools and programs. They may recommend prescription medications, nicotine replacement therapy, counseling, or other strategies to help you quit. Several factors can raise your risk of catching the common cold and passing it onto others. Fortunately, you can take steps to manage your risk factors and lower your chances of getting sick. Practice good hygiene, get enough sleep, and take steps to minimize stress. Avoid smoking or breathing in second-hand smoke. If you do get sick, take time off school or work. Give your body time to heal and avoid passing the virus onto other people.